Extensible 3D (X3D) Graphics and Humanoid Animation (H-Anim) include a coordinated set of steadily evolving ISO standards. The Web3D Consortium Standards Strategy carefully improves and evolves our standards while maintaining long-term archival stability. These standards are developed, tested, maintained and updated by Web3D Consortium members. Following public comment and approval by the Web3D Consortium, they are submitted to International Standards Organization (ISO) for a series of annual reviews. The X3D Working Group proceeds at the best speed supported by member and public contributions. Stable progress is paramount: we only advance standards when they are ready. 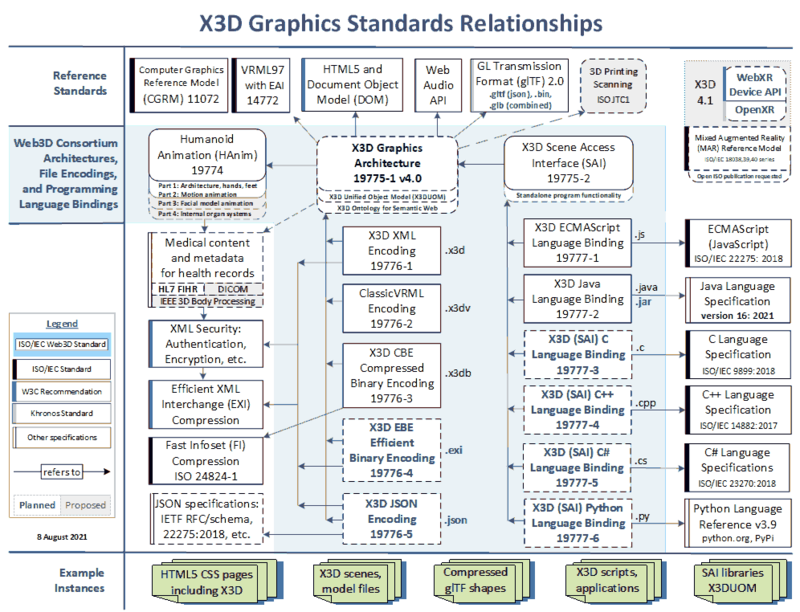 Backwards compatibility is maintained to the fullest extent possible, and so older versions of the X3D (and even VRML97) remain consistently correct and validatable in the latest version 3.3 of the X3D International Standard. The Consoritum has documented their Standards Adoption Process. Questions, comments and contributions are always welcome. CD Committee Draft First vote with technical comments on proposed standard or revision. DIS (was FCD) Draft International Standard (was Final Committee Draft) Last vote with technical comments on proposed standard or revision. FDIS Final Draft International Standard Last ISO vote on proposed standard or revision. This is a Yes/No vote only. IS International Standard Approved and published standard or revision. PDAM Preliminary DRAFT Amendment First vote with technical comments on an amendment. FPDAM Final Proposed Draft Amendment Last ISO vote with technical comments on an amendment. FDAM Final Draft Amendment Last ISO vote on amendment. This is a Yes/No vote only. AM Amendment Approved and published amendment to a standard. Web3D is a nonprofit organization that develops and maintains the X3D, VRML, and H-Anim international standards. These are 3D graphics file formats and run-time specifications for the delivery and integration of interactive 3D data over networks. Web3D Consortium members work together to produce open, royalty-free and ISO-ratified capabilities for the Web.